Please Note: Liberty Landfill is not owned or operated by Liberty Township. Their number is (517) 787-1177 and hours of operation are Mon. - Fri. 8:00 am to 4:30 pm and Saturday from 9:00 am to Noon. 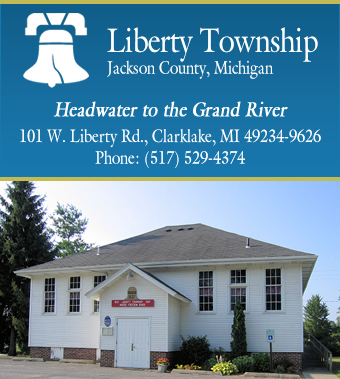 All meetings are to be held at Liberty Township Hall, 101 West Liberty Road in Clarklake, MI. The Cemetery shall be open to the general public from dawn to dusk each day. No person shall be permitted in the township cemeteries at anytime other than the foregoing hours, except upon permission of the township board or the sexton of the cemetery. Winter flower, plant and flag removal begins April 1st. Summer flower, plant and flag removal begins October 1st. Not sure if you are a registered voter? Please contact the Liberty Township Clerk at (517) 529-4374 or send an email. View recent election results, upcoming election information, voter registration information, etc. Before open burning, contact the Fire Chief so he is aware of your intentions!